I hope to one day run my marathon before this 2012 would end but never would I imagine that I would join 13 other crazy runners in their quest for 63KM from General Santos City to Koronadal City last July 13. 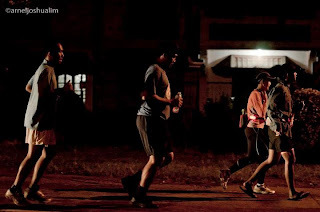 I had one terrible ordeal during the 12 - hour run of 63KM and I could only wish to share these tips should you wish to go through a marathon or an ultra marathon for injury - free run. Never run a marathon or an ultra - marathon without prior training program. A typical program may take 16 - 20 weeks with prior running base. Bring extra pair of shoes and socks just in case your feet get soaked from rain or water holes. Properly hydrate and carbo - loaded before, during and after the run for the needed fuel and recovery. Bring first aid like pain ointment or medicines. Bring your own logistics for immediate support. Bring your camera for documentation. Properly dress up for the run. Wear compression suit, head gear and water utility belt. If possible, use a pedometer for your guide.